Star Wars fans who never read the Expanded Universe novels might not recognize Grand Admiral Thrawn, but he’s become one of the most popular characters in the franchise. Thrawn initially appeared in Timothy Zahn’s Heir to the Empire trilogy, which was in the early 1990s as the official sequel to the Original Trilogy. For the first time, we learned what happened to Luke, Leia, and Han after Return of the Jedi. With Vader and the Emperor dead, Thrawn took lead the remnants of the Empire against the New Republic government. Thrawn was a new type of Star Wars villain, a mix of Sherlock Holmes and Erwin Rommel who used brilliant military tactics to defeat his opponents. Moreover, he was an alien who rose through the ranks of the xenophobic Empire. The Heir to the Empire trilogy was a financial and critical success, showing that fans still craved Star Wars almost a decade after Return of the Jedi left theaters. Thrawn in particular proved to be a hit. He regularly ranks as one of the most popular Star Wars characters ever. In the years since, Zahn has written several more books about the character. Thus, when Disney decided to reboot the Expanded Universe in 2014, fans were understandably worried that Thrawn would no longer be a part of the Star Wars story. Events of The Force Awakens override Heir to the Empire. Fortunately, Disney found a place for Thrawn in Season 3 of the animated TV show Rebels. Thrawn is still the hyperintelligent military commander, but now appears before the Original Trilogy. Lucasfilm also invited Zahn to write another Thrawn novel to provide backstory for the character. Hence Star Wars: Thrawn. Before continuing with the review, I should admit that I cannot evaluate this book in an unbiased manner. I’m a Thrawn fanboy. 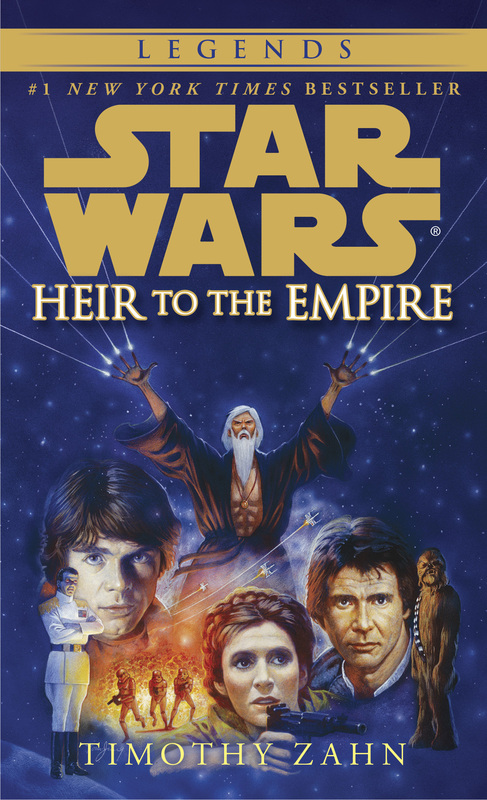 I read Heir to the Empire for the first time in 1994 and it remains one of my fondest Star Wars memories. Thrawn’s theories on leadership shaped how I view the world. I still remember his reasoning for promoting an officer who had failed to capture Luke Skywalker as a prime example of how to reward hard work under adverse circumstances. So I had mixed feelings about seeing the character return in the new canon. I love that Thrawn has become a part of Star Wars canon, but also want the stories to do the character justice. That said, Star Wars: Thrawn seems like a bit of a misstep. It’s not a bad book by any means, but I don’t think it captures what made Thrawn such a compelling character in the first place. First, Star Wars: Thrawn seems more like an excuse to provide backstory on Thrawn than an attempt to tell an engaging story. Thee plotting is unfocused, at best. There is a vague plot in which Thrawn tracks down a criminal called Nightswan, but most of the book simply tracks Thrawn’s rise through the Imperial ranks. It’s essentially a glorified excuse to spend time with Thrawn. There’s nothing inherently wrong with this (again, I love Thrawn), but Thrawn himself never gets a chance to shine. The challenges seem below Thrawn and tellingly he resolves most of the plot points very quickly and efficiently. Speaking of which, while Thrawn was always brilliant, in this book he comes across as overpowered. This Thrawn observes every minute detail and deduces his enemies’ motivations from almost nothing. Sometimes, his deductions felt just a bit too convenient. It feels like the myth of Thrawn has influenced the actual character. At the same time, none of his deductions came across particularly meaningful or memorable because the plot never provides him with sufficient challenge. Unlike in the original Thrawn books, Thrawn is using his genius to track down a group of drug dealers, not wage war against vast fleets. The book illustrates the risks of learning too much about your childhood heroes; Star Wars: Thrawn shows Thrawn as a young officer, but his missions at this phase in his life just aren’t particularly interesting. In the original books, Thrawn’s brilliance wasn’t just his powers of observation, but in how he responded to military or strategic developments. Thrawn was a Rommel to Palpatine’s Hitler. In Heir to the Empire, the Empire was constantly outgunned. As such, Thrawn had to devise new ways to utilize the Empire’s limited resources. For example, at one point, he tricks the Republic government into thinking that he had placed hundreds of asteroids in orbit around the capital planet, essentially paralyzing the government. It was immediately clear why Thrawn had become such a legend; his actions mattered on a grand scale. Zahn’s new book also undermines some of the mystery surrounding the character. In Heir to the Empire, we actually didn’t learn much about Thrawn. Zahn exhibited an admirable amount of restraint, only telling readers that Thrawn had spent several years exploring the Unknown Regions. In the 20th anniversary version of the book, Zahn notes that he deliberately did not make Thrawn a point of view character because he did not feel comfortable writing from an alien perspective. Thrawn was alien and therefore different, almost inherently unknowable. This left much to the imagination, which was great for Star Wars fans, who love speculating about secrets of the franchise. For example, I always saw Thrawn as a warlord who cared more about military glory than about political ideology, akin to a Julius Caesar or McArthur. By contrast, other fans viewed Thrawn as an honorable solider fighting on the wrong side, like a Robert E. Lee or Hannibal. Zahn’s new book leaves little room for interpretation because it spends so much time with Thrawn’s point of view. Each chapter begins with Thrawn’s observations about various military subjects. Later in the book, we learn about Thrawn’s reasons for joining the Empire (as well as his master plan). The book strives to turn Thrawn into a sympathetic character by unambiguously depicting him as an honorable warrior. He even berates an Imperial officer whose actions result in civilian casualties. Thrawn is certainly not a villain in this new era of Star Wars, which is a shame because I found the character much more interesting as a villain who nevertheless earned the reader’s respect. Zahn’s Star Wars: Thrawn does improve on its predecessors in a few ways. Thrawn’s sidekick, Eli Vanto, works better as a “Watson” to Thrawn’s “Holmes” than Captain Gilad Pellaeon, the sidekick in the original books. Pellaeon was a senior Imperial officer, so he sometimes came across as incompetent next to Thrawn. I as a reader seemed to grasp Thrawn’s strategy before Pellaeon did. By contrast, Vanto is a younger cadet from the edges of the Empire, so his naivety makes perfect sense in context. Moreover, Vanto isn’t just a foil to Thrawn. He doesn’t agree with all of Thrawn’s decisions and makes his objections known. Star Wars: Thrawn isn’t a bad book, but suffers from the inevitable comparison to its predecessors. I’m glad the character of Grand Admiral Thrawn lives on in this new era of Star Wars, but the Heir to the Empire Thrawn will always be the definitive version for me. Hopefully, the new book and Rebels will lead younger fans to discover Zahn’s original trilogy.